Happy New Year to sponsors, partners, and those who follow news about the New Hope for Children Orphanages in India! Diane and Winston felt God's call to help Pastor George Fernandes with his ministry when they first visited India a couple of years ago. 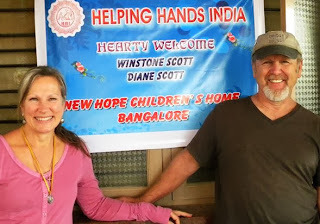 They learned about Helping Hands India and New Hope Orphanages through their daughter Hannah, who served as a volunteer there for about five months. Our plan is that a new 501(c)(3) organization established by the Scotts will become the official international partner for Pastor George and Helping Hands India. The new organization, Helping Hands India International, has taken responsibility for the Helping Hands India website, and you will find more information about their mission here: www.HelpingHandsIndia.org . The website is still under construction. Does this mean that sponsors and partners with New Hope for Children Orphanages will have to change anything? No, you can continue your child sponsorship through Big Family Mission. We expect that new sponsorships will soon begin to be processed through HHI International. I (Ken) will continue to help with the orphan ministry in India as we go through the transition... and after that as the Lord leads. Please keep Winston and Diane in your prayers! They are just returning from India after a 3-week visit. Thank you, Winston and Diane, for your service and your obedience to our Lord's sovereign will! P.S. We still have 29 children at New Hope for Children who need sponsors. If you are not already sponsoring, NOW would be a great time to begin. You can see photos and read brief bios about the children here: Children at New Hope who still need sponsors.